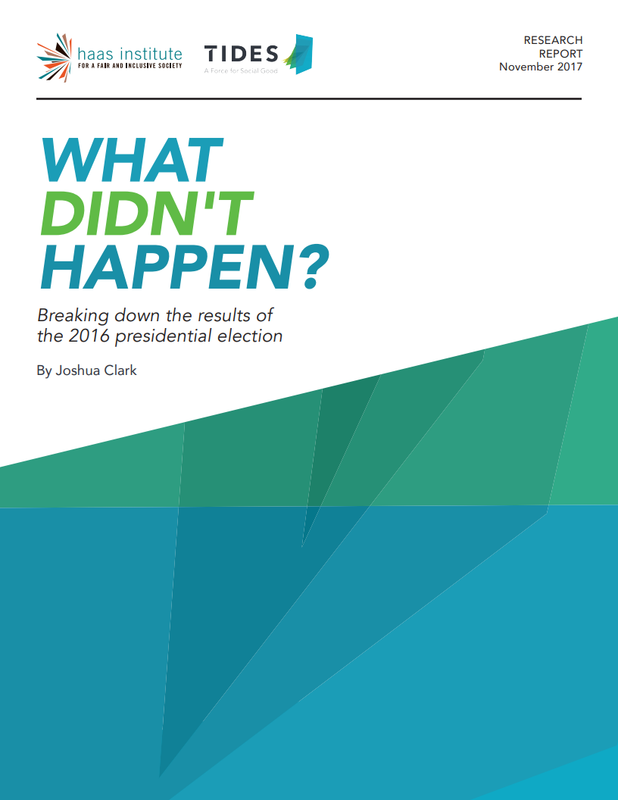 Haas Institute co-releases new report with Tides analyzing the realities that led to the unexpected outcome of the 2016 US presidential election. BERKELEY: Donald Trump defeated Hillary Clinton in a bitterly fought 2016 campaign by outpacing past GOP candidates among rural whites and whites without a college degree, particularly in states where turnout simultaneously dove among Democrat-leaning groups, a new study from the Haas Institute at UC Berkeley and Tides argues. The report, titled “What Didn’t Happen? : Breaking Down the Results of the 2016 Presidential Election,” and authored by Tides Senior Fellow Joshua Clark, uses data from the US Census Bureau, major post-election surveys, and other sources to examine shifts in voting behavior among different demographic groups that led to last year’s major upset. The report is the first installment in a multi-year collaborative initiative by the Haas Institute and Tides, a philanthropic partner and nonprofit accelerator. “White voters without a college degree had the unexpectedly large influence they did, not so much because Trump’s margin with them was dramatically larger than Mitt Romney’s, but more because they accounted for a larger share of the electorate than anticipated in some key states,” Clark says. “This was due to their own increase in turnout rate compared to 2012, combined with very significant decreases in African American turnout--quite likely abetted by voter suppression laws,” he adds. While Black voters overwhelmingly supported Clinton, their turnout rate dropped to 59.3 percent from 66.6 percent in the previous election. The swing states of North Carolina, Ohio, and Wisconsin lost at least 80,000 Black voters each. Turnout rates among Black voters under the age of 45 dipped to their lowest rates since 2000. New voter ID laws, early-voting cutbacks, elimination of same-day voter registration and other voter-suppression techniques have been instituted in many states since 2012. Available research suggests that such laws are most likely to pose barriers to voting among the young, the poor, and Black and Latino communities. Voter abstention and an uptick in support for 3rd party candidates, particularly among the young and in “Rust Belt” swing states, were other key factors that shaped the outcome of the election. Among the dominant media narratives the report challenges is that Trump enjoyed widespread popularity across the Rust Belt, where he won the states of Michigan, Pennsylvania, Wisconsin, Ohio, and Iowa, all of which President Barack Obama won in 2012. When taken state-by-state, and county-by-county, different stories begin to emerge that complicate that narrative. Of those five states, voter participation rates were in fact down in three compared to the previous election, were essentially stagnant in Michigan, and increased substantially only in Pennsylvania. And despite slightly higher voting rates in Michigan, Trump and his Democratic rival Hillary Clinton ultimately received 200,000 fewer votes than Obama and Romney did in 2012. That state witnessed a spike in votes for third party candidates and the practice of “undervoting,” or leaving the presidential section of the ballot blank. “These trends in third-party voting and voter abstention push back against the narrative of unbridled enthusiasm for Trump in the Rust Belt,” Clark says. Future publications in this initiative will address what recent research tells us about fighting back against voter suppression; how different forms of racial, cultural, and economic anxiety influenced 2016 voting choices; and what role anti-government and anti-elite sentiments are playing in ongoing reconfigurations of the electorate. Tides is a philanthropic partner and nonprofit accelerator dedicated to building a world of shared prosperity and social justice. For more information on Tides’ work, please visit www.tides.org.